Dato’ or Datin Sri Siti Nurhaliza is a highly accomplished and much acclaimed Malaysian artist. Dato Siti, throughout her long, award-wining career has worn many hats like singer, songwriter, record producer, television presenter and businesswoman. Siti was born on the 11th of January, 1979 in Awah, Temeroh and she was the fourth child in a family of eight siblings. Her father, Tarudin Ismail was a police officer, while her mother Salmah, was a homemaker. Siti’s family had always been musically inclined, for her mother was a famous traditional singe,r while her grandfather was a well-known violinist. These musical talents were passed on to Siti and her siblings, and she along with two of her sisters and her brother went on to become highly acclaimed singers. Siti made her singing debut at the tender age of 16, in Malaysia’s popular reality show Bintang HMI in 1995. She went on to win the show and received recording contract offers from as many as four different international record companies. Her very first single ‘Jerat Percintaan’ from her first album won a clutch of awards and proceeded to sell more than 800,000 copies in Malaysia itself. Since then, Siti has gone from strength to strength as her powerful voice has mesmerized music fans from around the world. During her long and distinguished career she has won more than 200 local and international titles including Voice of Asia in 2002 (awarded at Almaty in Kazakhstan), the Gold Award at the Asia New Singer Competition held at the Shanghai Asia Music Festival in 1999 and two awards at the 'South Pacific International Song and Singing Competition 1999' held in Gold Coast, Queensland, Australia. Aside from these awards and accolades, she has also been chosen to perform at various prestigious events like at the closing ceremony of the 1998 Commonwealth Games, held in the Malaysian capital city of Kuala Lumpur. During this performance, she shared the stage with well-known international music personalities, Celine Dion and Rod Stewart. 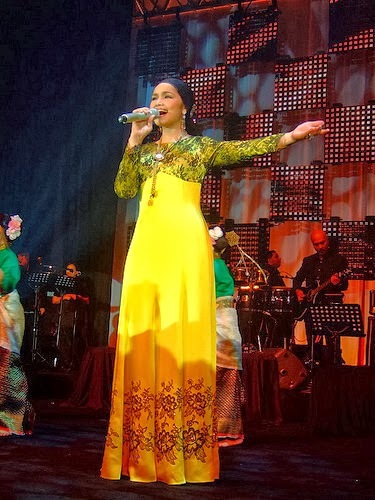 In 2005, she also became the first South-East Asian singer and third Asian singer to perform a solo concert at London’s prestigious Royal Albert Hall. She was accompanied by the famed London Symphony Orchestra at this performance. In that same year 2005, she was ranked as Asia’s second best artist by MTV Asia and she also won the title of Asia’s Biggest Artiste on the region’s Channel V network. Soon after in 2008, she was named Asia’s Idol by the Asia News Network. Dato Siti’s great success in Asia has led her to be bestowed with several titles including "Voice of Asia" and "Asia's Celine Dion". Siti has performed all over the world in countries like Japan, Kazakhstan, Australia, China, Indonesia, Brunei and England. Today, she is not only an artist, but is also a successful businesswoman who not only endorses products but also has her own successful cosmetic line and own production company. During Siti’s long career she has sung in many languages including Bahasa Malaysia, Bahsa Jawa, English, Mandarin, Japanese and even Hindi! If you are not familiar with Dato Siti’s work do watch her singing the song ‘Tin Tak Tana’ in Hindi here.